In episode 6, there are more cinematic exploits from Rosie and we hear about Jessica’s plan for a whole week of fun. There are some top 5 inspirational ladies and a film review of seminal film classic, ‘Burlesque’. In episode 5, Rosie and Jessica are quickly sidelined into the dos-and-don’ts for being a pedestrian, especially in wet weather. There’s a bit of a theme, as they discuss their trip to ‘Top Hat’ and reel off their Top Five musicals. Plus a new feature which makes it in on name alone and a Podcast Pick. In episode 4, Rosie and Jessica detail the epic undertaking that was sorting out the Guide shed, plus visits to vintage fairs and, you’ve guessed it, the BFI. Taking on the Top 5s this week is the world of television – who will reign triumphant, and who will just be an honourable mention? Needle and Fed brings us some Ravelry raiding and cupcakes only suitable for a ‘puppy shower’. In episode 3, Rosie and Jessica venture outside of the podbooth to bring you a report from a cafe. There is bunting but not necessarily sunshine. There’s a rundown of their Top 5 books, The Tea Cosy Report and an update on recent Guiding activities and camp blanket plans. Oh, and Rosie’s been to the theatre. Again. In the second episode, Rosie and Jessica get caught up on the past fortnight’s escapades, including many trips to the BFI and a lengthy discussion of the appeal of ‘day dresses’. Plus Top 5 Sitcoms and the regular crafting and baking update, Needle and Fed. 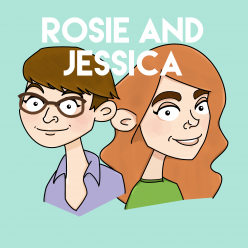 In the first episode of their podcast, Rosie and Jessica introduce themselves and the sort of the thing you can expect from the show. There’s talk of films, knitting projects and the two major food groups Jessica can’t eat.